Well this cow costume was white construction paper with black spots on it made into a headband. There were also brown construction paper ears coming off it. It wasn't a very good costume, but it got me free food. I had a big lunch today, i cooked up a total of 3 quarter pound cheeseburgers, the first one with scrambled eggs and cheese on a waffle, and then a double cheeseburger with onions and fries. A couple of lovely doughnut peaches. Currently enjoying a 2015 bottle of South African Shiraz, while dipping into and mixing, slices of beef offcuts infused with garlic, pimento filled green olives, and KP jumbo-sized chilli peanuts. A snacky night, I think. That sure is one fancy dinner. I wouldn't call it fancy, DO. The beef offcuts cost £1.59, the olives £1, and the peanuts 89p, while the bottle of Shiraz was half-price at £5:50. I didn't mean expensive fancy but it definitely isn't your average non-expensive dinner like pizza, cheeseburgers, hot dogs, chicken nuggets, fish and chips, etc. 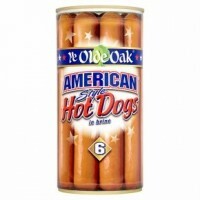 Had they had a jar of Ye Olde Oak 6 American Style Hot Dogs in I would have bought that instead of the beef offcuts. They sell hot dogs in packs of 6 in your land, over here it's 10 to a pack or 8 if you want jumbo, which are better. Hot dogs in a can, what an odd idea. It is not a can, it is a jar. We get them in 6, 12, or 24 here. Usually 12. A large bar of Galaxy chocolate, which I received as a thank you present. I decided to go vegetarian for my lunch, i made tortillas. I used a package of mixed vegetables including rice, lima beans, black beans, and peas and added shredded cheese, sour cream, Taco Bell mild sauce, and crushed up Doritos to it. It didn't taste that bad actually. The remaining slices of beef offcuts, sliced up even smaller, and marinated in a chilli sauce, mixed through black-eyed peas/beans and rice with sweetcorn. Drinking a bottle of Californian Chardonnay. My new batch of homemade cider will be ready tomorrow. I have a corn-fed free-range chicken slow roasting in the oven (100 degrees for three hours - two hours to go) to accompany it. Honey-coated parsnips and carrots will go in in an hour, along with par-boiled tatties. Gravy to be made from the chicken juices. They taste like orange candy. You are braver than me. I saw them I a grocery store and flinched. So you think they are ok? I've tried the A&W root beer ones before. They're not bad. I haven't tried the orange Crush ones.